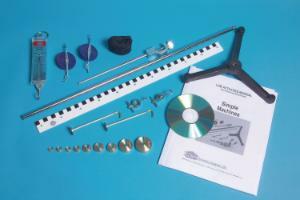 Recommended for grades 3 to 8, this set is ideal for introducing students to the concepts of changing force by levers and pulleys, and the notion of mechanical advantage. The manual describes experiments with the three types of levers, single and double pulley systems, and shows the characteristics of each machine. Please note: This product emits laser light. Max. output power1mW per beam. Wavelength 650nm. Class IIIa laser product. Set includes: 1 lever with centimeter scale, 2 Pulleys, 1 Spring scale, 2 Weight hangers, 1 Slotted weight set, 1 Base and support rod, 1 Support rod with clamp, 2 Hook Collars, 1 Pulley cord, & 1 Experiment manual.